Your Machine should be brought to the course and be in good working order along with all the machines accessories. 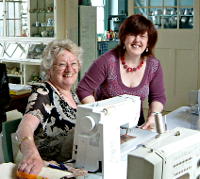 If you do not own a sewing machine or overlocker one can be provided for use on the day at no extra cost if you contact Ruth at least 5 days before your course. All the courses come with concise instruction sheets and threads, cords and all other haberdashery are supplied. Needles, scissors, pencils, rulers, pins, etc. required for the courses are available to use and extra accessories are also available to try yourself. There is a small fee for the materials that are provided in a fabric pack supplied by Ruth all cut to size and pressed ready to use. The cost of a day is from £85 excluding material costs (£3.50 - £7.50 per pack etc.) and excludes cost of travel which is charged at 40p per mile. Payment is due on completion of visit and should be made payable to Mrs Ruth Jarman. For courses and workshops taking place over 50 miles from Ruth's home in Kent accommodation must be provided the night before the class. Read through the courses and decide on the topics that you wish to cover and over how many days, e-mail for more information or telephone 01634 719232 to arrange a convenient date for your classes. Accurate fee quote available on request.